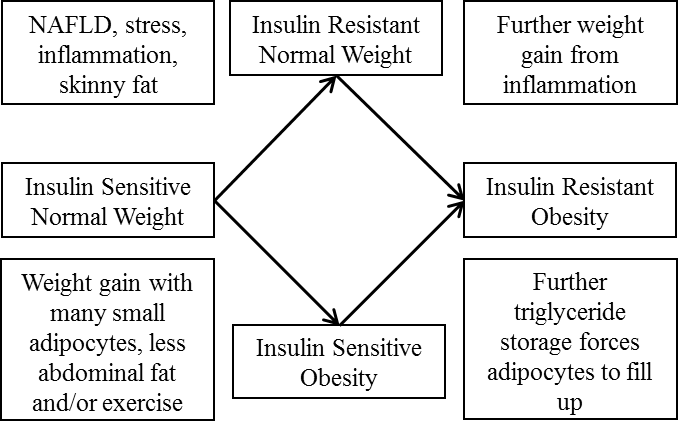 There are several differences between insulin resistant and insulin sensitive obesity. People who have insulin resistant obesity have abdominal obesity, increased oxidative stress and inflammation, lower AMPK, PGC-1α and adiponectin, more liver and muscle fat accumulation, larger and fewer adipocytes, hypoxic adipocytes and macrophage infiltration in adipocytes. Insulin resistant obesity mainly occurs due to overflowing adipocytes where elevated free fatty acids spill into the bloodstream and initiate an inflammatory cascade, resulting in insulin resistance. 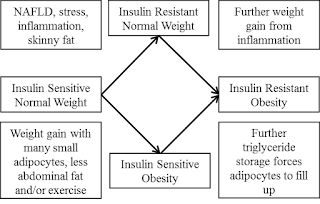 The similarity of mechanisms between insulin resistance and leptin resistance and the positive feedback loops involved suggest (to me) that in most, but not all cases insulin sensitive obesity and insulin resistant normal weight are simply intermediary states and two different pathways to the same endpoint - insulin resistant obesity (assuming no change in diet or lifestyle). The differences between insulin resistance and leptin resistance just explain which path was taken. Being insulin sensitive and overweight or insulin resistant and normal weight, while better than insulin resistant obesity, is sign that something isn’t right and needs fixing. However, the exception to this rule is if a formally overweight/obese person has lost a significant amount of weight, but not all of it. In this context they are still overweight, but have regained insulin sensitivity due to weight loss. Their adipocytes may be greater in number, but of a normal size, potentially explaining why they are currently insulin sensitive and also why they have difficultly losing the last bit of weight. (2) Think skinny people don’t get type 2 diabetes? Think again. Many studies find that mitochondrial dysfunction is associated with insulin resistance and is a cause of T2D. There are fewer studies on mitochondrial dysfunction as a cause of insulin resistance, but they exist  and the mechanisms are very plausible. Perhaps mitochondrial dysfunction ought to be better defined. Maybe instead of less ATP production (because UCPs lower ATP production and reduce oxidative stress) mitochondrial dysfunction should be defined as satisfying these three criteria: lower ATP production, mitochondrial oxidative stress and mitochondrial DNA mutations. Why Do We Care About Diet, Lifestyle and Health?